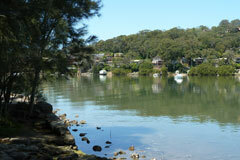 Georges catchment is located in Sydney and has a catchment area of 1,890 square kilometres. Parramatta, Campbelltown, Liverpool, Sydney, Camden. View real-time data from the Georges catchment on this website. The largest water storages, Woronora Dam and Prospect Reservoir, are owned and operated by the Sydney Catchment Authority to capture and control water flows for Sydney Water to supply homes and businesses in Greater Sydney with a reliable reticulated water supply. Sydney Water Corporation, local councils, tourism and heavy industries. While the natural flow of rivers and streams in the Sydney Central-Georges River catchment has been altered by water storages such as dams and weirs, the basin is considered an unregulated system. This is because there are no water storages owned and operated by State Water or the NSW Office of Water to provide water to licensed water users, such as farmers. To preserve water resources in river and groundwater systems for the long term it is critical to balance the competing needs of the environment and water users. Water sharing plans establish rules for sharing water between the environmental needs of the river or aquifer and water users, and also between different types of water use such as town supply, rural domestic supply, stock watering, industry and irrigation. Under the Water Management Act 2000 all water sharing plans are required to have performance indicators to assess whether the plans have been effective in meeting their objectives. The Environmental flow response and socio-economic monitoring. Greater Metropolitan - progress report 2010 ((PDF 3.4 MB)) summarises activities undertaken in the previous water year and provides an interim assessment of outcomes from the investigations.